The 59th annual Western Weekend in Point Reyes Station got off to a merry — but tiny — start Saturday at the Dance Palace. In a large corral across Sixth Street, Point Reyes-Olema 4-H Club members showed a total of only half a dozen dairy cows and heifers. “Where are all the other animals?” asked architect Sim Van der Ryn, a long-time resident of Inverness. But aside from five chickens and five rabbits in cages outside the back door of the Dance Palace, there weren’t any more. 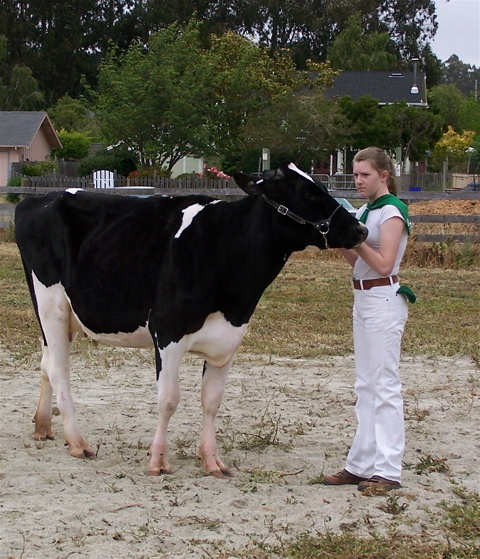 Janelle Kehoe’s Holstein cow was the livestock show’s grand champion. 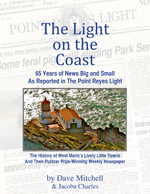 As it happened, a copy of The Point Reyes Light with the 1995 livestock show results was lying around my cabin, and after Saturday’s show, it occurred to me to compare the number of entries this year with the number of winners back then. I was shocked by how dramatically participation has dropped off. 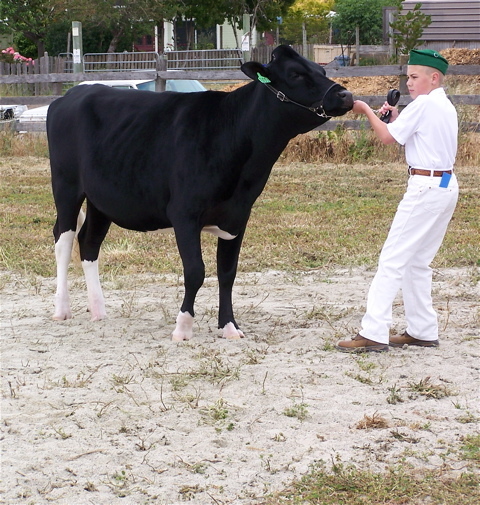 The 4-H Fair winners 13 years ago included: nine beef cattle (this year, no entries); 12 dairy cows (this year, six entries); six dogs (none); 10 horses (none); four sheep (none); three cavies aka guinea pigs (none); three small animals/pets (none); 11 rabbits (five). One of the most fascinating facets of poultry competition in the 4-H Fair amounts to herding chickens with a pencil. Competitors are not supposed touch their bird with their hands while herding it down a folding table, so Frankie Kohrdt is carefully holding back although her chicken seems perplexed. Nathan Hemelt’s Holstein was named reserve champion in the dairy cow showmanship competition. 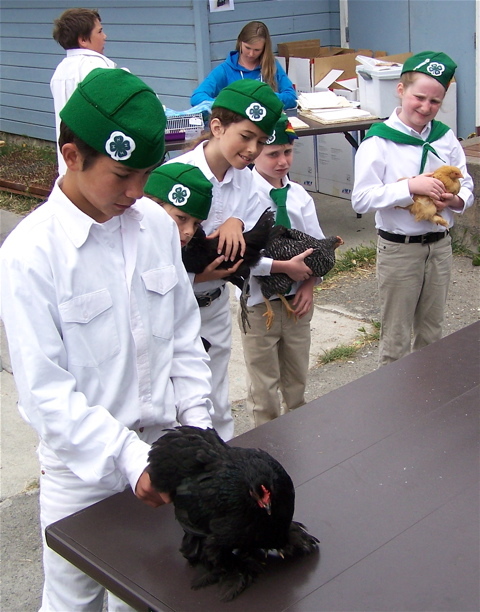 With great concentration, River Aguire uses a pencil to nudge his wayward chicken down the judging table. Watching intensely are all his fellow competitors (from left): Frankie Kohrdt, McKenna Kohrdt, Adriano Puppo, and Olivia Puppo. 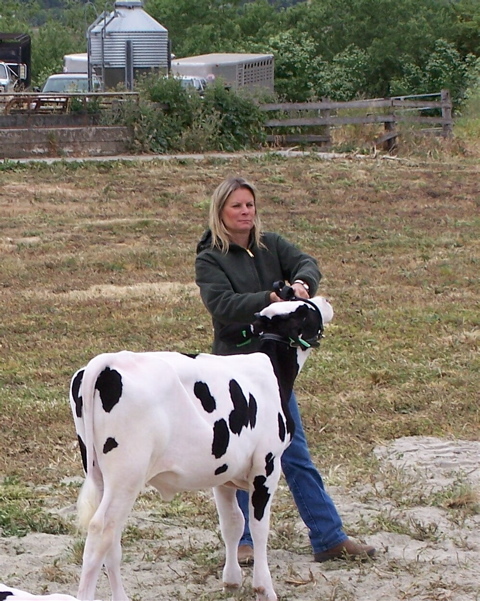 Carol Horick of Point Reyes Station keeps a tight lead on a rambunctious heifer during “adult showmanship” competition. Instead of an animal show that in years past lasted all day, Saturday’s was over in less than two hours. And it would have been even shorter were it not for a mostly for-fun competition, adult showmanship. Adults, including parents of 4-H members and mere bystanders, were rounded up to show cows. Judges asked the adults not to chose their own children’s cow to show, and most complied. Why is the livestock show shrinking so dramatically with each passing year? Certainly one reason is the reduction in ranching throughout West Marin. Some ranches for economic reasons have had to greatly scale back, for example by replacing a dairy operation with beef-cattle grazing. A number of the ranches acquired by the National Park Service have been shut down. And the demographics of West Marin’s ranching community are also changing; fewer young parents can afford to live and raise 4-H members here. 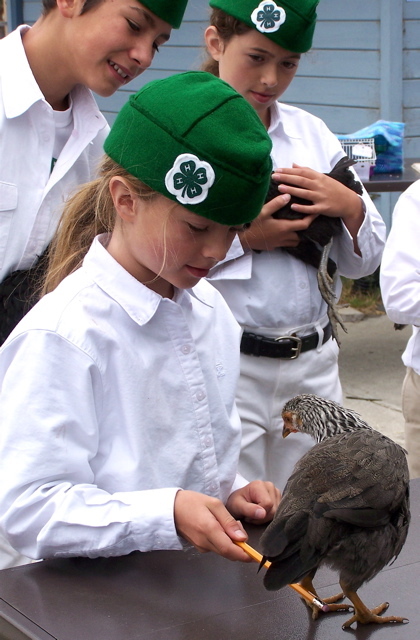 In addition, 4-H clubs from throughout Marin and southern Sonoma counties once took part in the livestock show. No longer. Ruler of the roost: Adriano Puppo’s chicken stands head and tail above the chicken belonging to his older sister Olivia. The 4-H’ers father said that as newly hatched chickens, the two spent last winter in the family garage where they took to this close arrangement for staying warm. 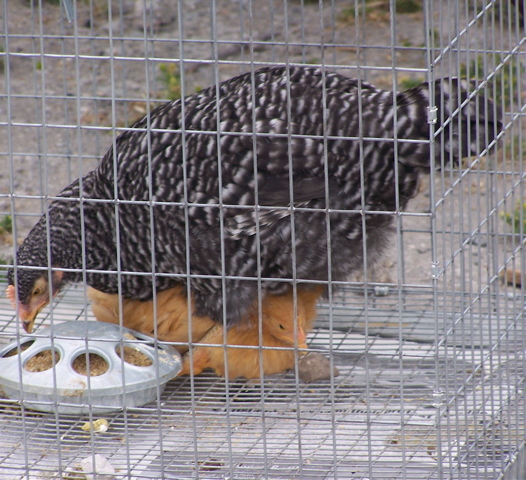 Now that the weather is warmer, the two still prefer a vertical arrangement when hanging out together, and Olivia’s chicken pushes its way under her brother’s chicken almost as often as his chicken climbs on top. Traditionally, the Western Weekend parade was held the day after Saturday’s livestock show, but this year there were “scheduling conflicts,” according to the sponsors, the West Marin Lions and Rotary clubs. The parade down the main street of Point Reyes Station will begin at noon Sunday, June 8. There will be a silent auction from 10 a.m. to 4 p.m. that day in the Dance Palace. West Marin Senior Services will hold a chili and cornbread cookoff at 1 p.m. at Toby’s Feed Barn. And Halleck Creek Riding Club for the Disabled will sponsor a Cow-flop Drop; the fundraiser uses a grided field behind Toby’s and is sort of like roulette, with a cow and her plop substituted for a croupier and ball. In addition, Marin Farm Bureau and Organics will hold a barbecue at Toby’s from 1 to 3 p.m., and winners of the Western Weekend raffle will be announced at 2 p.m. at Toby’s. A Western Weekend Queen’s Dance will be held from 8 to 10 p.m. Saturday, June 7, in the Dance Palace. Sparsely Sage and Timely is powered by	WordPress 4.9.10 and delivered to you in 0.434 seconds using 50 queries.